Buying a new car can be exciting. The chance to score a great deal is especially alluring and right now seems to be the perfect time to buy a car. 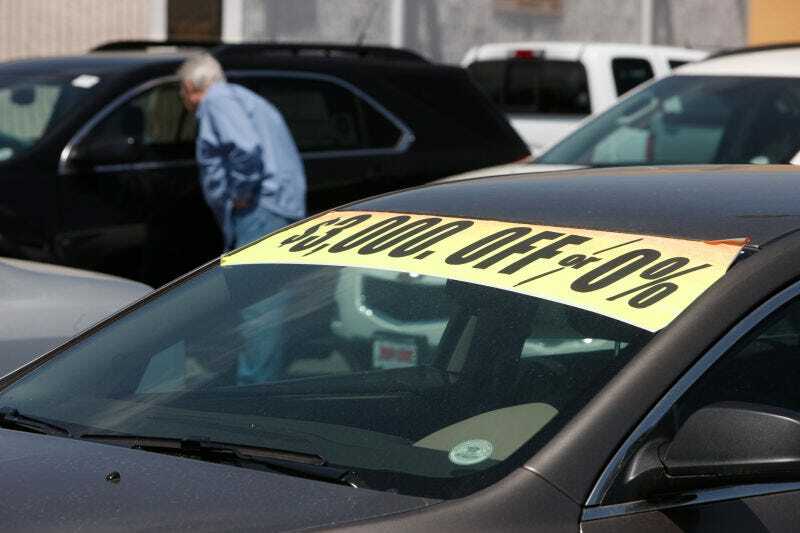 Car sales are down, incentives are up and used car prices are falling. A good chunk of you should probably hold off for awhile, however. Right now, a record number of buyers are underwater on their current car—but that’s not the only problem. A combination of factors could be creating a perfect storm of long-term loans, low equity, and persistent debt. This situation is partially a result of falling used car values. When new car prices drop, used car prices take a dive to stay competitive. This leads to a buyer’s market for pre-owned models. This also means your used trade-in will be worth less. Lower trade values can often offset some of the additional savings that are being offered on new models. So the net cost to the buyer is no better than buying a car when the industry is not desperate to move units. The loss of equity in a trade-in is also contributing to the staggering number of buyers who are underwater on their loans. According to Automotive News, about 33 percent of buyers are in negative equity situations and those people are rolling over an average of $5,195 into another loan. For a lot of buyers that extra five grand or so doesn’t seem like a big deal, since people don’t look at total loan cost and only focus on monthly payments. Lenders and dealers are happy to move underwater buyers from one negative equity situation into another. Now banks are extending loans for up to 84 months, keeping buyers trapped in an unending cycle of debt. I have sympathy for people who find themselves in a tough spot financially with a car loan, but I don’t blame the dealers and I don’t blame the banks. All too often the fault lies with the buyer who signed the contract without doing some simple math. According to Kelly Blue Book, average transaction prices for new cars is up 2.6 percent from 2016 to $33,261. Not only are people rolling over negative equity, they are often trading up to more expensive cars. This wouldn’t be too bad if buyers kept their cars well past the loan payoff date, but a lot of people get into this cycle of getting a new car every 3-4 years and the combination of negative equity and long loans feed a vicious financial cycle. Millennial buyers especially trade in their cars like they turn over their cell phones, in two to three-year cycles, rather than try to keep them long term and build equity. It’s easy to be tempted by what looks like a great “deal.” I’ll never forget when I was a teenager, I went to my local surf shop for an end of the season sale. I walked around the store for about 20 minutes looking for something to spend my summer earnings on. The manager came up to me and said, “You know Tom, it’s not a ‘sale’ if you don’t need it. It’s just spending money just to spend it.” Those were wise words. I left that store empty handed, but feeling good about my decision. So before you go car shopping for a new ride, take an honest look at your financial situation. Check out what your current car is worth. Is it less than the loan balance? Is your FICO score lower than 700? Is your current ride treating you well? If you answered “yes” to those questions, maybe tune out the hype and hold onto it a bit longer until the time is right for you to buy a new car.